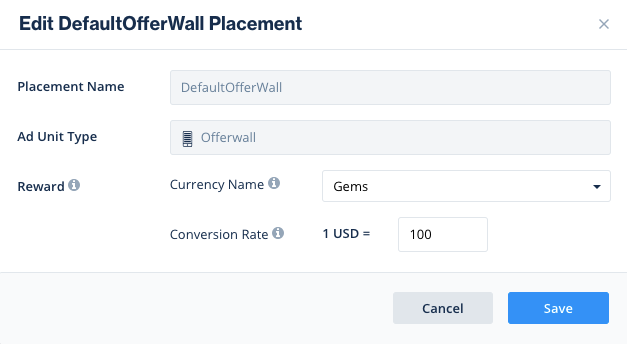 In order to generate revenue for your app with our Interstitial ad unit, you will have to integrate the ad unit in your code and activate the Offerwall on your ironSource Dashboard. To set up the ironSource Offerwall, you’ll need to add your app to the platform. 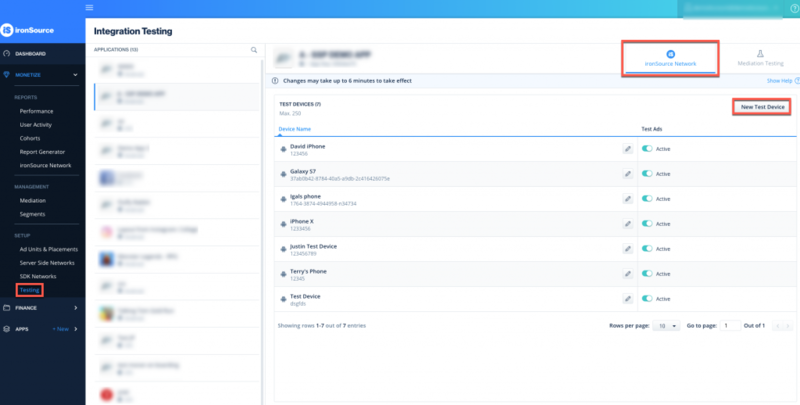 Follow this guide for instructions on how to set up your app. You will see a DefaultOfferwall placement that you can edit or you can add a placement by clicking ‘New Placement‘. Click the ‘Edit’ icon to change the reward configurations. Enter the ‘Currency Name’ of the virtual items that will be rewarded the user after completing an offer (ex. coins, gold, … ) and the ‘Conversion Rate’ which is the reward amount that will be granted to the users for every dollar you receive from ironSource. We recommend starting at ‘1 USD = 100‘ to make the conversion as profitable as possible for you. Learn more about currency settings here. 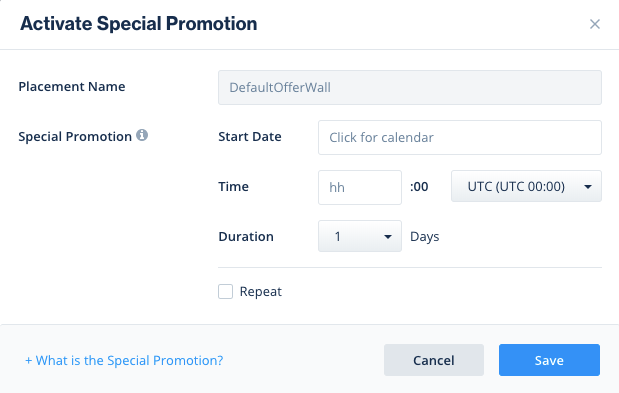 You can also ‘Activate‘ the Special Promotion, a feature that doubles the rewards for your users for a limited timeframe. The Special Promotion spurs users to complete more offers, resulting in more revenue for you! Enter the Start Date, down to the hour and the duration (how long you’d like the Special Promotion to run) and choose your time zone. Click ‘Save‘ to activate. To make sure that your users will be rewarded with virtual currency, you need to create an endpoint on your server so we can notify you of the user reward. Following the reward notification, you will need to reward your users. Select either Client-Side Events or Server-to-Server Callbacks. If you don’t set up any callbacks, you will not receive notifications about your users’ rewards. Note: If the state of client-side callbacks section is ON it means our server will notify you about the reward event but if you haven’t set an endpoint to listen to this event, you won’t receive the notification. Note: For Offerwall you must supply the callback. Private Key: If you’d like to certify the callback to ensure the callback’s authenticity and that it came from the ironSource server, enter a private key which we will use to hash (encode) the callback. 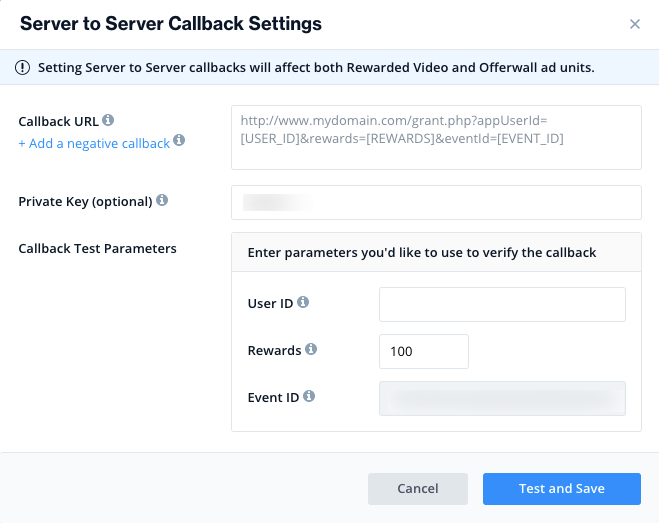 Callback Test Parameters: To test the callbacks, enter a user ID, reward amount and event ID. Our system will configure a reward callback for you. Once you click ‘Test and Save’, our server will send a test callback to your configured Callback URL in the exact manner that it will do so for an actual user reward. To serve the ironSource Offerwall to your users, you must implement the Offerwall Ad Unit in your code as described here. Next, set your set the ad unit to Test mode and verify your integration by adding a test device on the Integration Testing page. 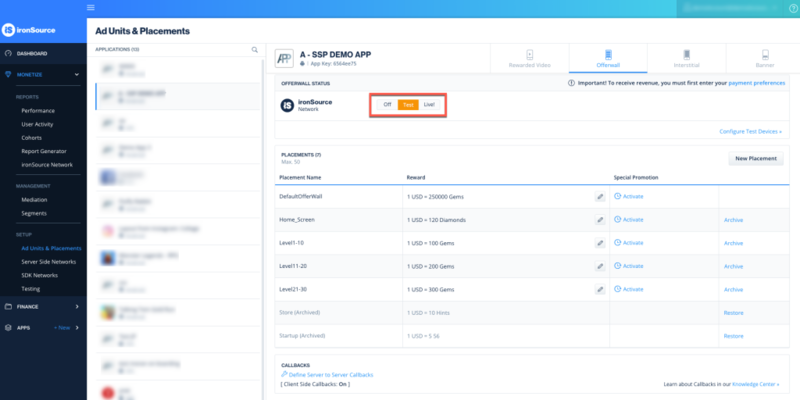 This module allows you to verify the integration of all ad units on specific devices so you can test ad delivery without affecting your live app version. You control the test ads on your Test Devices and can add, edit or remove Test Devices (per OS) as you see fit. Read more on the Integration Testing tool here. Once you’ve successfully tested ad delivery, activate the ad unit. If you don’t have permissions to activate the ad unit on your dashboard, simply contact us and we will activate it for you. To active the ad unit and receive the revenue it generates, you must provide Company and Payment information. Your app can now receive live Offerwall ads.